Simple meal.. The spring mix has a thai sesame ginger dressing with wonton strips, tomato and chopped candied pecans.. The Shrimp is EASY. Heat Coconut oil in a deep sauce pan. 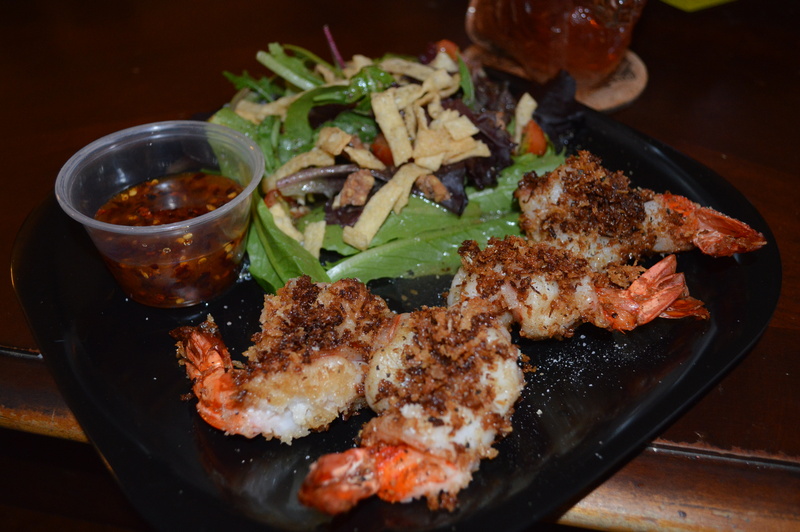 Butterfly and dredge tiger shrimp in whole milk(light in calories but great flavor), and then roll in a dry mix of tradition japanese panko and shed coconut. Dop in the hot oil for less than 3 minutes and voila! ready to chow down. *For the dipping sauce, stir together 2 parts apricot, to one part white distilled vinegar. add in your heat preference of chili flakes and mix accordingly.